Rohit Cutting Tools India manufacturers High Speed Steel Punches (HSS Punches) in HSS M2, HSS M35, HSS M42 , HSS T42 & Powder Metallurgy grade. - These are 2 Step Punches for Heavy Load application since their Head Diameter is +3mm of Tip diameter. We are the most trusted suppliers of HSS Profile Punches in Bangalore. Punches are manufactured from suitable grade of High Speed Steel material as per DIN-9861 or IS -4296 Shape- D standards. These are available in sizes from 1 mm X 30 mm length to 20 mm X 100 mm length. We offer HSS Punches that are specially designed to meet the specific requirements of the customer. HSS punches are also manufactured according to the industrial and customer requirement, any quantity of HSS punches are welcomed. 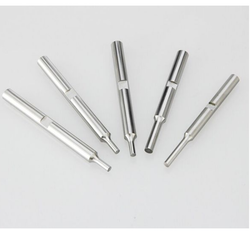 We are leading manufacturer of High Speed steel punches "HSS punches". According to the specific requirements of patrons, the offered range of step punch is obtainable in diverse specifications & can also be customized. This is well designed by our skilled team of professionals by making use of top quality material in accordance with the international norms. We are offering HSS Round Piercing Punches. We are renowned companies of the market for providing the premium quality collection of HSS Punches. we are the tool and die industries for last 25 years.